Dinner at Bar Cesar. Don't be put off by the generous serving of aioli, these are some of the best potatoes I've ever had. A few months ago, my friend, Dominic, and I stopped by the Piedmont location of Bar Cesar to have dinner and sat at their patio on an uncharacteristically warm evening. This time around, we branched out from our favorite dishes and decided to try all new ones. We started with fresh garbanzos with cumin. 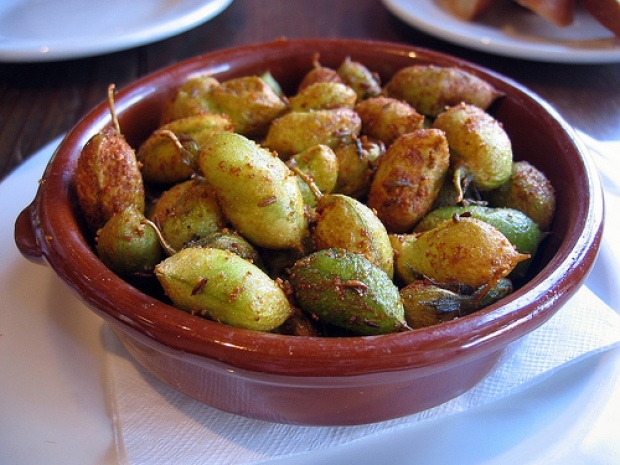 I love garbanzo beans (what Middle Easterner doesn’t?) but have never had them fresh in their pods. These were deliciously addictive and perfect with our Affligem blond ales. 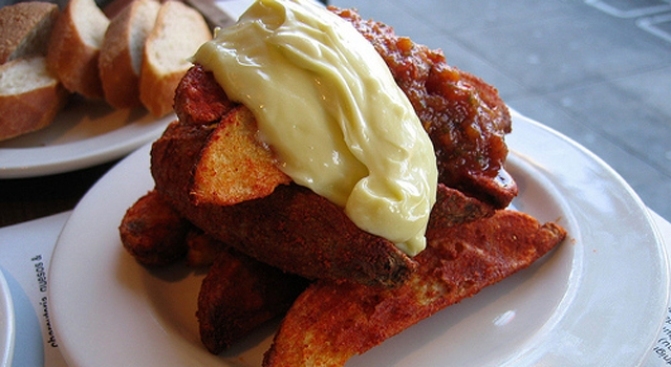 Next, we tried the oven-dried tomatoes, lomo and green garlic aioli on grilled bread. These were good, but not my favorite of the meal by any means. I felt like they could have used more flavor. We always try a cured meat when we visit Bar Cesar, and this time we tried the cecina, or air-dried beef. This was tasty and almost pastrami-like in texture, but sturdier. I prefer the fuet that I’d tried so long ago but would definitely try the cecina again too. The real star of the meal was the patatas bravas. Do not be put off by the generous serving of garlicy aioli - these potatoes are out of this world. If there is one tapa you must try at Bar Cesar, this is it. Dinner apparently wasn’t enough to sate our appetites for Spanish cuisine, so the next morning, Dominic and I revisited Bar Cesar for brunch. We shared the patatas pobres, a hearty and filling dish of potatoes, mixed cured meats and peppers topped with a fried egg. Next, we had the migas con chorizo y huevo, made up of bread crumbs, chorizo, fried onions and fried egg. We pierced the egg and let the gooey yolk mix with the other ingredients, and it was delicious. We ended our brunch on a sweet note with churros con chocolate. Bar Cesar always has the best churros, but I could do without the chocolate sauce, which was too sweet for my taste. Bar Cesar’s Piedmont location remains my favorite tapas restaurant - the service is warm, the vibe is unpretentious and their dishes are solid. One of these days I’ll have to find time to visit their Berkeley restaurant as well.